It is the country's largest IT company and tops the BT 500 ranking based on its market performance. But it is for many other humane reasons that the 100,000-strong women workforce of TCS holds the company in high esteem - its gender diversity and goodwill are a few of them. The human resources head of TCS for the UK and Ireland, Nupur Mallick, will definitely vouch for it. For Mallick, January 2, 2002 was a turning point in her professional life. Finding it impossible to balance her work life with motherhood, she had then decided to quit her job as an HR manager of a small unit of TCS in Mumbai. Unable to muster courage and speak to her boss N. Chandrasekaran, the present CEO and MD who was then the Head of Sales, she had sent her resignation letter by post a few days ago. However, when Mallick walked in to Chandrasekaran 's office on January 2, he wished her Happy New Year and returned her resignation letter. "His reassuring smile was enough for me to take back my resignation," recalls Mallick. She was then allowed a long leave to attend to her infant. There has no looking back for her after that as she went on to become the HR head of TCS in Mumbai and then in 2006 got elevated as HR head for the UK and Ireland. A similar experience awaited Arathi Subramaniam in 2009. As head of a product vertical, she was then required to travel overseas frequently. But a family emergency forced her to choose between family and profession. Instead of resigning, she decided to have an open conversation with her employers. "They gave me a role where I didn't have to choose between my constraint and growth. I didn't have to take a step back in my career," she says. Just last week, Subramaniam became the head of governance, risk management and compliance across all corporate functions of the company. The organisation's ability to offer diverse roles and its sensitive and empowering approach to the challenges that the women workforce face have definitely won many hearts. 'We have always believed in hiring people who grow with the organisation. When women began to drop out at the mid-management levels, it was not just difficult, it was also an expensive proposition,' says Ajoyendra Mukherjee, EVP, Global Head (HR), TCS. "I have never been made to feel that I am a woman, rather I have always been empowered," says Mallick. Michele Lemmens, Centre Director of TCS' all-woman BPO in Saudi Arabia, says she was surprised when the company agreed to give her a chance to head a business in a difficult market like Saudi Arabia. "I am all for challenges. The company recognised it and gave me a chance," she says. Lemmens had to start the business from scratch last year but has already built a 300-member all-woman team. Currently, around 33 per cent of the total workforce of TCS are women, a number Chandrasekaran is very proud of. He clarifies that the company's focus on gender diversity is not just an effort to meet a metric. "We are a company that believes in meritocracy. All these women are phenomenally capable people, have deep expertise in running the business, be it in operations, customer orientation, domain knowledge or delivery excellence in terms of people skills. We are trying to promote people with a lot of capability," he says. Less than a decade ago, the company had to face a high attrition rate when several high-performing women employees, especially in the middle and senior management levels, gave up their careers for family. This apparently seems to have led the company to carefully structure its gender diversity policy by enabling women to get the right work-life balance. "We have always believed in hiring people who grow with the organisation. 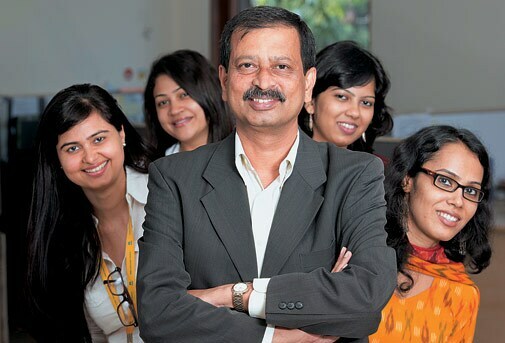 When women began to drop out at the mid-management levels, it was not just difficult, it was also an expensive proposition,"says Ajoyendra Mukherjee, Executive Vice President and Head, Global HR, TCS. So the TCS management under the leadership of Chandrasekaran went all out to ensure that their women force stayed on. The company offered extended maternity leave, flexibility on the kind of roles one would like to opt for and even long leave during their kids' Class X or XII exams. "When my daughter was 15 months old, I got an opportunity to move to Chennai to manage a larger function, but I didn't want to do so. However, I was not sidelined because I refused to move. Rather I was put in an equally good role in Bangalore itself," says Vijaya Deepti, VP and Global Head, Insurance Products, TCS. One of the oldest woman employees of TCS, Deepti says that she has always been measured as per the results that she has delivered. TCS helping its woman employees to take a much-needed break from work is definitely a boon but getting back to work after that too has been often challenging. "Most women employees are sceptical about taking up challenging leadership roles and prefer to take a backseat, especially after they come back from a long leave," says Ritu Anand, VP and Deputy HR Head, TCS. To address this, the company has employed counsellors and put in place programmes like Re-Orientation, Stay Connected and iEXCEL. "We familiarise them with the leadership opportunities and positions that are available. We also teach them skills to manage diverse teams and roles, and get other woman employees handling leadership roles to talk to them," says Mukherjee. TCS conducts two-three iEXCEL programmes a year and each has at least 20-30 participants. "Our midlevel women attrition levels have come down dramatically with these programmes," says Mukherjee. The company's overall attrition level is at 12 per cent, while the industry attrition is higher at 14 per cent. K. Sudarshan, Managing Director of EMA Partners, a placement firm, is full of admiration for TCS' gender diversity policies. However, he wonders whether there are enough women holding key leadership roles in the organisation. Only 12-13 per cent of the senior management roles in TCS are occupied by women, though 33 per cent of the company's 335,000 workforce are women. "That needs to change," agrees CEO Chandrasekaran. "If we have 33 per cent women at the company level, there is no reason why we shouldn't have 33 per cent women at the senior most levels." So, is there a chance that the next CEO of TCS would be a woman? Chandrasekaran remains diplomatic. "I guess, it's too early to say, but it's all about giving equal opportunities. In our company, we focus on an empowered management structure and empowered teams. We have a lot of phenomenal people and we will grow all of them."